Do Whale Sharks, the World's Biggest Fish, Eat People? Swimming with Whale Sharks: Cancun's Newest Lure. Could You Handle It? The USA's #1 foreign vacation destination is Cancun. This easy-to-reach, sun-and-fun town has it all...including whale sharks! •Cancun boasts some of the most fabulous beach resorts anywhere, like Le Blanc Spa Resort and NIZUC (as well as relaxed family resorts like Fiesta Americana Grand Coral Beach). Plus a thriving international dining scene, glorious beaches, and balmy surf that hosts every water sport imaginable. But back to those whale sharks. Cancun's calm, turquoise-hued Caribbean waters are home to the largest concentrations of whale sharks on the planet. This means that Cancun is the best place to swim with these behemoths. I have to say, I'm not intimidated by much. I've rappelled waterfalls in Australia, cliff-dived into an ocean blowhole in Hawaii, and (most spine-chilling of all) driven solo in loco Mexico City traffic. Yes, I've done quite a few of the top 10 nature adventures as selected by TripSavvy. Swimming with whale sharks is one of them, so I knew my time had come. What could be more luxury travel than a rare wildlife encounter in sophisto Cancun? It was time for me to test the waters. Still…whale sharks? Their size is jaw-dropping. These fish redefine huge. So I was feeling a little nervous about meeting them face-to-fin. Would they drop their own jaws and try to eat me? Find me annoying and squash me? Or just scare the living daylights out of me? Or do whale sharks attack? To get an idea of a whale shark's size: a garden-variety whale shark is 25 to 30 feet long. Many of them are as big as school bus (which is 45 feet in length). I read that whale sharks can reach 80 feet long nose to flipper, as long as an NBA basketball court. How tough am I? I needed to find out. I was determined to conquer my fear of the planet's biggest fish. I flew down to Cancun and joined a whale shark expedition. Whale sharks aren't going to come tickle your toes on a Cancun beach. You have to join up with a whale shark expedition. I found Cancun's best: Solo Buceo. Founder Alberto Friscione Carrascosa is an expert on sea creatures and a protector of whale sharks. Carrascosa is a world-class scuba divemaster who has been named one of the world's Legends of Diving. This shark wrangler is also divemaster to the stars. He has introduced thousands of wetsuited humans to the blue deep – including divers Tom Cruise and Bruce Willis. Finding Solo Buceo is a good first step. You'll sign waivers, smear on your eco-friendly, biodegradable, high-SPF sunscreen, and gather at a soberingly early hour to board a dive boat: a small, open motorboat. Got that? I have some advice for you. Opt for a morning trip. Whale sharks disappear in the afternoon, diving deep for a quiet nap on the ocean floor. (Principled whale-shark outfitters don't even offer afternoon trips). OK, now you have to find the whale sharks/ Heading out on the motorboat past Cancun's long coral reef, I was frightened but super-excited; fear was my adrenaline. Bring on those behemoths! 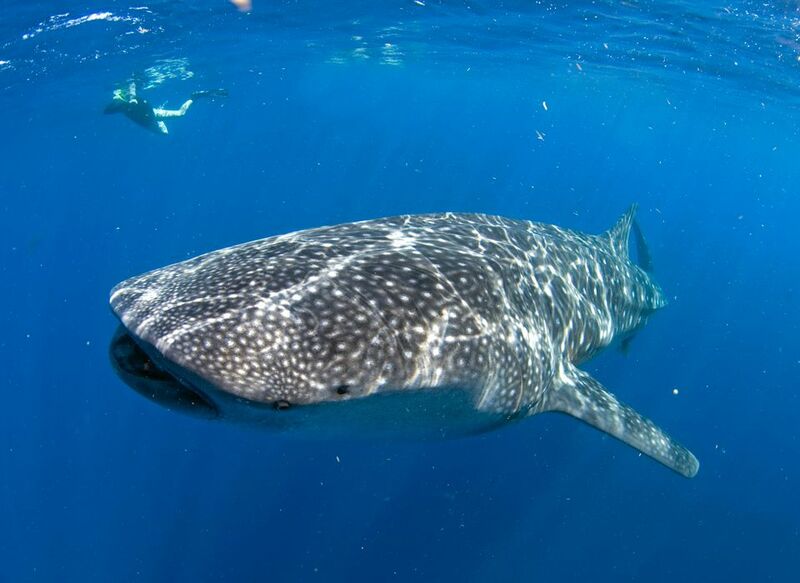 Cancun's whale sharks are around from May through September. But finding them is a bit of an art; they don't exactly Tweet their current location. It can take an hour. Or more. My expedition, we searched for an hour and a half. But once you sight a whale shark pod, you know it. Whale sharks make their presence known from afar. Their fins part the seas in their wake. And even though they're swimming below you, their handsome, white-spotted gray backs are visible through clear Caribbean water. Thar she blows! Once the whale sharks are spotted and the boat cuts its engines, it's time to get in the water. My moment had come. It was my turn to jump in. Yikes! As soon as my safety-mandated swim buddy had hit the water, I dared myself to jump into the Caribbean Sea. Out in the middle of nowhere, surrounded by the biggest fish on Earth. Sharks. It's another world when you first jump in: wet, blue, nearly silent. Welcome to slow, tranquil Whale Shark World beneath the sea. OK, I made it into the water. What next? Whoa! There was a gargantuan whale shark just a few yards from me. He or she knew I was there – they have incredible senses and can perceive the tiniest splash. But the whale shark completely ignored me. Summoning my nerve, I swam right up to its endless flank. I was nothing in comparison. Suppose you held your iPad Mini to your hip. That's the scale. The whale shark was moving languidly, And I started to paddle my fins alongside. I have to admit it was strange to still be totally ignored by the supersized animal. Yet it was also a thrill to realize that I was in the water practically up against this powerful, primeval creature. And I'd been promised it wasn't going to eat me. Can we talk for another moment about how big whale sharks are? No land animal even comes close. (An elephant? That's like a Corgi by contrast.) Gigantic would be the word. Rodrigo Friscione, Alberto's son and also a Solo Buceo expedition leader, states it simply. "This is the biggest shark in the world, and therefore, the biggest fish in the world. We're insignificant to them." How does it feel to be in the water surrounded by a handful, or dozens, of whale sharks? You realize that…in their world, you're a nobody. What a concept. The truth is, you don't matter to a whale shark. But it's good for your soul to be brought down to earth…in the middle of the ocean! Even when you're totally relaxed and confident that you're not a warm snack for a whale shark, swimming with them has its terrifying moments. I had the shock of my life when one enormous specimen swam toward me with its giant mouth w-i-d-e open, like a garage door. My heart caught in my throat, and I swam away very, very, very quickly (which of course was pathetically slow to a shark). But the shark didn't follow. The shark didn't care. The creature was indeed on a feeding mission. But it wasn't hungry for me. Here are the facts. Whale sharks don't have teeth! And they follow a seafood diet of zooplankton and small baitfish. They frequently open their mouths to gulp water using their baleen, a giant sieve-like contraption built into their mouths. So they open their mouths wide to take in seawater – and the goodies in it. Bottom line: people should have no fear of whale sharks. If anything, they should be afraid of us. Only three of the 275 known shark species have been known to attack people. Annually, fewer than 20 humans worldwide are killed by sharks. But up tens of millions of sharks (some say 100 million) are murdered by humans, mostly to make Chinese shark fin soup. Killed for soup! But Now for the Happy Part Back to me, in the water, remembering all this whale shark biology and feeling safe from the slack-jawed Caribbean colossus. I gathered my nerve and swam toward another whale shark. This one, like the first, totally ignored me, lazily cruising beside my legs. This giant of the deep was not in the least interested in a funny-looking small fish with a silly mask-face and a ponytail swishing in the water. I realized that, like the other small fish that hang around the mellow whale sharks, humans quickly get more comfortable with them. My whale shark was a mellow fellow. He and I swam side-by-side for a while. It was very calming, almost slow-motion. Yet my mind was racing at the wonder of it all. I felt like we two were bonding somehow. I felt protected by a benign presence. It was like being a toddler again, in my grandmother's loving arms. But then the whale shark decided it had had enough of me. It accelerated and glided away. Call me sentimental, but it was a spiritual experience. When I came home, I felt like a lot of stress had evaporated. I'd conquered my fear and shimmied with massive whale sharks. I'd shared their serene aquatic home, basking in their confidence and majesty. Everything just seemed a little easier from then on. I now feel that being amidst whale sharks in their natural habitat is a true bucket-list experience. Even if Cancun wasn't already an irresistible getaway destination, I'd go again just to swim with its whale sharks. You think they'll notice me next time? 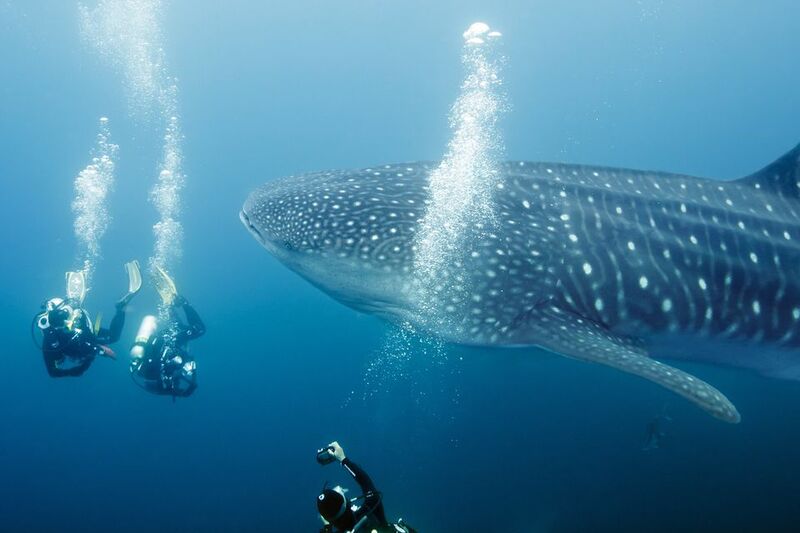 .As is common in the travel industry, the Guest Author was provided with a complimentary expedition and accommodations in order to write about the Cancun whale shark experience. .